San Diego, CA—The results of a phase 2 clinical trial presented at ASH 2018 suggest that early therapeutic intervention is beneficial in patients with high-risk smoldering multiple myeloma. 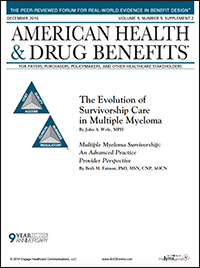 The triplet regimen of pomalidomide (Pomalyst), bortezomib (Velcade), and low-dose dexamethasone (PVd) significantly extended progression-free survival (PFS) compared with the doublet of bortezomib plus dexamethasone (Vd) in patients with relapsed or refractory multiple myeloma who had previously received lenalidomide (Revlimid) therapy, according to new data presented at ASCO 2018. Chicago, IL—The era of immunotherapy in multiple myeloma is near. Two presentations at ASCO 2017 demonstrated that cellular therapy can steer immune reconstitution against multiple myeloma. Chicago, IL—In patients with newly diagnosed multiple myeloma, the addition of daratumumab to carfilzomib (Kyprolis), lenalidomide (Revlimid), and dexamethasone (ie, the KRd regimen) is showing promise as a frontline treatment regimen. According to the results of an open-label, phase 1b study presented at ASCO 2017, induction therapy with the KRd regimen was well-tolerated, and the overall safety profile was consistent with previous reports for KRd, with no additional toxicity observed with the addition of daratumumab. Moreover, the study investigators reported that the regimen was very effective, with 100% overall response rate observed. San Diego, CA—The addition of venetoclax (Venclexta) to bortezomib (Velcade) and dexamethasone yields high response rates in patients with relapsed or refractory multiple myeloma, especially in patients with disease that is not refractory to bortezomib and who received 1 to 3 previous lines of therapy, according to findings presented by Philippe Moreau, MD, Department of Hematology, Nantes University Hospital, France, at the 2016 American Society of Hematology meeting. San Diego, CA—Nelfinavir (Viracept), a drug used for HIV, led to a surprisingly high response rate when added to bor­tezomib (Velcade) in patients with proteasome inhibitor–refractory multiple myeloma, according to a phase 2 study reported by Christoph Driessen, MD, myeloma specialist, Kantonsspital St. Gallen, Switzerland, at the 2016 American Society of Hematology meeting. San Diego, CA—High response rates with the combination of elotuzumab (Empliciti), lenalidomide (Revlimid), and dexamethasone in the treatment of patients with high-risk smoldering multiple myeloma suggest that early intervention may be worthwhile in this patient population, based on results from a phase 2 study, said Irene M. Ghobrial, MD, Attending Physician, Medical Oncology, Dana-Farber Cancer Institute, Boston, at the 2016 American Society of Hematology meeting. Since the “War on Cancer” was declared in 1971, advances in cancer treatment and prevention have accomplished considerable success in reducing mortality and morbidity in many tumor types, and more Americans than ever are surviving cancer.